Long live the Hot Toddy, the reigning winter cocktail champ. The ease of preparation and the comfort it provides make the Hot Toddy an ideal holiday party tipple. After all, its four main components are simple—spirit, citrus, sweetener and hot water—and the resulting cocktail is a guaranteed hit. This year, encourage your guests to personalize their Toddies by setting up a welcoming DIY Hot Toddy bar. How to do it? Start with the classic Toddy building blocks and let loose. Whiskey’s a great spirit to start with, but try offering fall-flavored applejack or even tequila. Depending on your spirit, change up your citrus and sweeteners too. Set out flavored simple syrups for guests who are feeling adventurous, and let them get wild with festive mix-ins like pumpkin puree, apple cider and hot tea. Don’t forget the final flourish: Display plenty of whole spices for garnishing those Toddies, like tall cinnamon sticks, coins of fresh ginger, star anise pods and even a few bottles of bitters. Arrange your spirits, mix-ins and hot water along your bar and let your guests handle the mixology work for you. Need a few starter recipe suggestions? Find mug after brimming mug of warming winter inspiration below. 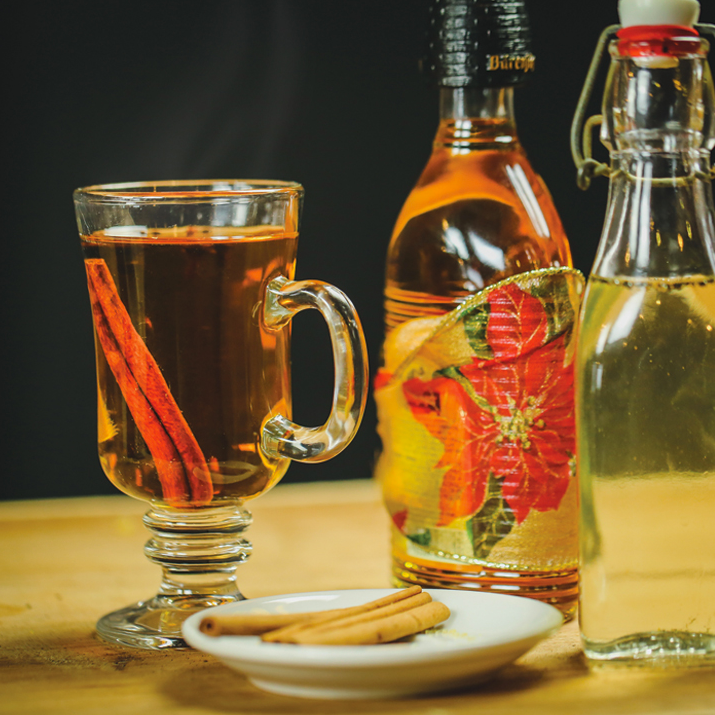 Vanilla and cinnamon simple syrups lend smooth sweetness to your Toddy. Love a hint of winter spice? Float a few cloves and cardamom pods for a big impact.